Wind energy as a global investment opportunity: Will Canada be a global player? A surprising $47 billion dollars are invested in wind energy in over 60 countries. Making a significant contribution to energy demand. What’s exciting is that wind energy can be built to different scales allowing for different types of ownership. With the right types of social finance options, community groups can be stimulated to build locally owned wind developments. For example, Municipal Equity Ownership exists in Quebec and First Nations Equity Ownership. So what kinds of opportunities does this present for Canada? Here’s what I found out at the Canadian Social Responsibility Conference in Winnipeg. This is how Robert Hornung, President of the Canadian Wind Energy Association kicked off his presentation to the Canadian Social Responsibility Conference in June. Last year, Brent Kopperson from the Windfall Ecology Centre spoke at the Social Finance Forum at MaRS. Kopperson highlighted examples of locally owned wind development in Germany. Germany, a country one-third the size of Ontario, produces 32,000 megawatts of energy from renewable sources. 50% of all wind projects in Germany are locally owned; 65% of projects in Denmark are locally owned. In 10 years in Germany the renewable energy sector created 215,000 new jobs because of the more labour-intensive nature of the renewable energy sector. In Europe where these great strides were made, the efforts started at the grassroots level. Back to the Canadian Responsible Investment conference, Hornung challenged the investor audience to examine the Canadian landscape. 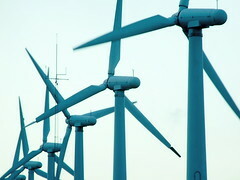 He noted that Canada is the world’s sixth largest energy producer and only 16th in the world for producing wind energy. With high interest in wind energy in the United States and the advancement of technology, Canada has an opportunity to build a new industry. However, Hornung spurs us not to sit on our heels while competition strengthens. He gave us a Canadian example from PEI where wind energy investment will increase energy productivity beyond its current electricity consumption. “Why would PEI aim for higher productivity?” Hornung asks. Because of the opportunity to sell energy into the north-eastern United States. PEI sees a market that is growing and is taking advantage of that by building the infrastructure to make it happen today. This September, CanWEA will hold its Infinite Possibilities conference in Toronto from September 20th-23rd. From the CanWEA website: “Canada’s rapidly expanding wind energy industry is well positioned for growth. This year, more than 2,000 delegates and 225 exhibitors will come together for CanWEA’s Annual Conference and Exhibition to explore the infinite possibilities of wind energy in the country. Join Canadian and global industry leaders at Canada’s largest renewable energy conference.” The Infinite Possibilities is an eye opening title to encourage investors to learn about the advantages that are available in this new wind energy industry.